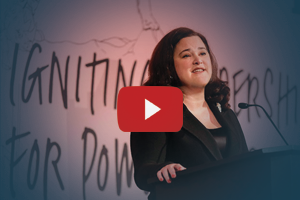 As the decision-making body at the highest level of organizational leadership, boards play a critical role in creating an organization that prioritizes, supports, and invests in diversity, inclusion, and equity. Whether in the hiring of the executive, the determination of strategy, the allocation of resources, or the goal of serving the community with authenticity, the board’s leadership on diversity, inclusion, and equity matters. As stewards of the public good, all social sector organizations, regardless of mission, are called on to embrace and celebrate our common humanity, and the inherent worth of all people. In doing so, we must also acknowledge that a climate of growing intolerance and inequity is a challenge to our democratic values and ideals. Divisions along economic, racial, religious, and political lines have created an increasingly polarized society in need of healing. And the complex issues and dynamics at the intersection of race, class, gender, and sexuality call for deeper thinking as we seek to understand each other. 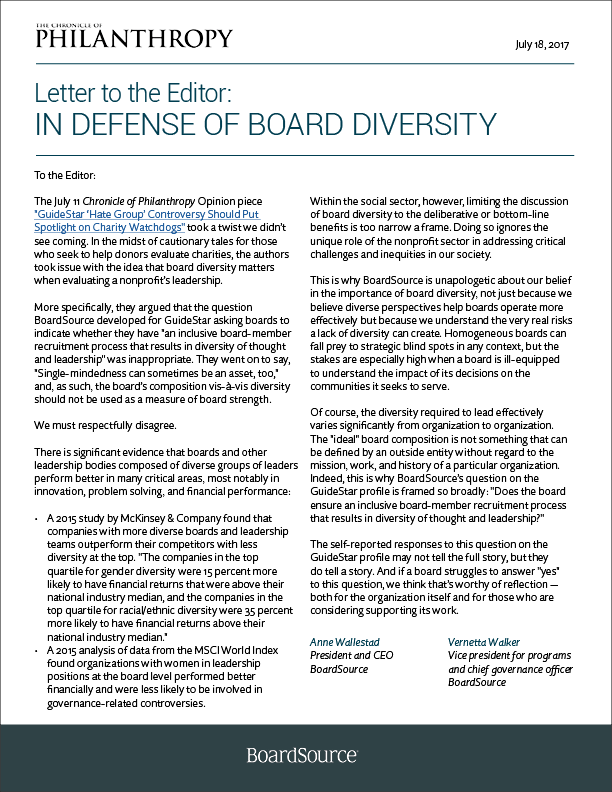 diverse: The individual leaders who compose nonprofit boards are a reflection of an organization’s values and beliefs about who should be empowered and entrusted with its most important decisions. We believe that all social sector organizations can better achieve their missions by drawing on the skills, talents, and perspectives of a broader and more diverse range of leaders, and that the diversity of viewpoints that comes from different life experiences and cultural backgrounds strengthens board deliberations and decision-making. inclusive: The most effective boards work to build a culture of trust, candor, and respect — none of which is possible without a culture of inclusion. Boards that cultivate an inclusive culture ensure that all board members are encouraged to bring their perspectives, identity, and life experience to their board service. An inclusive board culture welcomes and celebrates differences and ensures that all board members are equally engaged and invested, sharing power and responsibility for the organization’s mission and the board’s work. equity-focused: Boards play a critical role in helping organizations understand the context in which they work and how best to prioritize resources and strategies based on that reality. 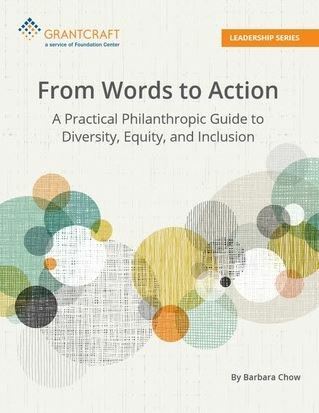 An awareness of how systemic inequities have affected our society and those an organization serves enables boards to avoid blind spots that can lead to flawed strategies, and creates powerful opportunities to deepen the organization’s impact, relevance, and advancement of the public good. Read more about BoardSource’s Commitment to Diversity, Inclusion, & Equity: For Ourselves and the Social Sector. 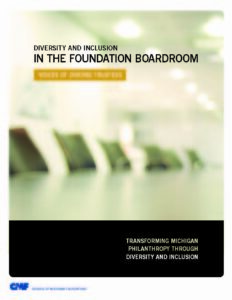 The following resources have been curated by BoardSource and reflect what we believe to be some of the best thinking and practical advice to boards on diversity, inclusion, and equity – and the relationship between the three – across the social sector (and beyond). While some of these resources apply to specific sub-sectors (higher education, foundations, etc. ), we believe that all of them have relevance to the work of nonprofit boards of all kinds. Read what BLF attendees shared in discussion groups following. 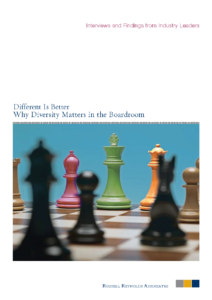 The fact is, the issue of board diversity is not the mere diversification of boards, but the inclusiveness of boards. This post discusses the difference between the two and what needs to be done. 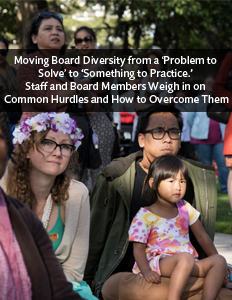 In this blog post, the Community Foundation for Greater Buffalo’s president and CEO and governance committee chair discuss the importance of board diversity in advancing their organization’s mission. Emphasizing diversity when selecting board members should also include economic diversity. While it may be tempting to fill a board with high-net-worth individuals, it is not always the best choice for the board or your organization’s mission. 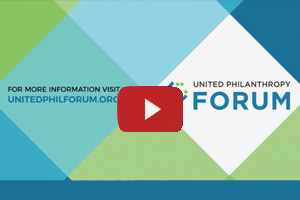 What if the beneficiaries of the hardworking organizations that foundations serve were represented among foundation leadership? 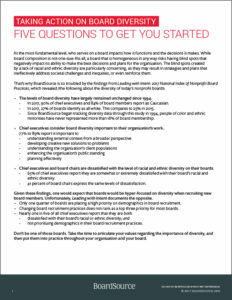 Thoughtful consideration of the questions in this article can help your board move beyond good intentions to develop an action plan. And action is needed, because decades of evidence show the value of diverse boards and suggests that diversity won’t happen without intentionality. 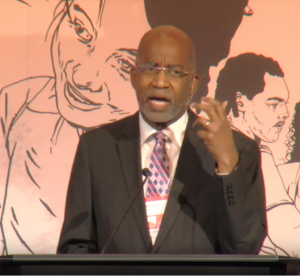 In the social sector, a board that lacks racial and ethnic diversity risks a dangerous deficit in understanding on issues of critical importance to the organization’s work and the people it serves. 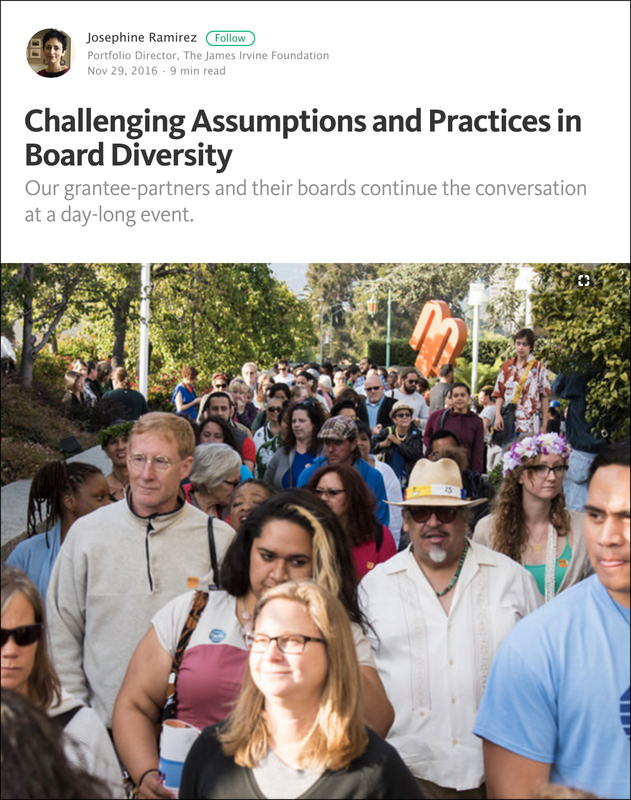 BoardSource’s Leading With Intent report shows that diversity has actually declined on nonprofit boards. Is this a question of ineffective or inept action? Or are boards simply not prioritizing diversity? Find out in this exclusive webinar. 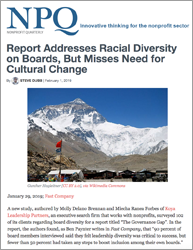 BoardSource just released its report on board diversity, and the statistics are frustrating, disappointing, and somewhat anger-inducing….The lack of diversity on boards is no longer just annoying. It is a critical issue. 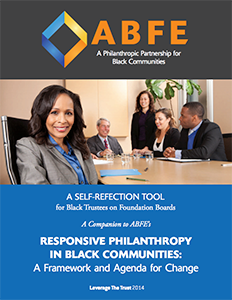 After a fraught last few years in terms of national attention to issues of race, one would expect that nonprofit boards would demonstrate at least a modicum of advancement in the realm of diversity. 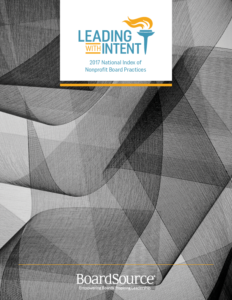 The comparative statistics shown in Leading with Intent: 2017 National Index of Nonprofit Board Practices tell a different story. A study of the state of nonprofit boards makes it clear that they have a privilege problem–and that more engaged board members are a big bonus to an organization. The group’s true goal in commissioning the study was not just to point out what’s wrong, but to set groups on a path to fix it. 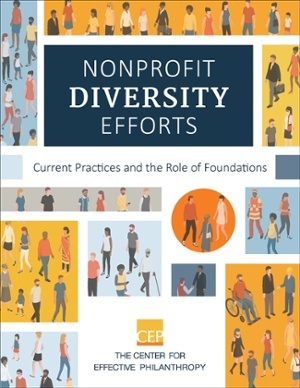 Nonprofit leadership remains predominantly white and isn’t likely to grow more diverse anytime soon, according to a new report. Whites fill 90 percent of board seats and CEO positions, according to BoardSource, a research and support organization for nonprofit boards. 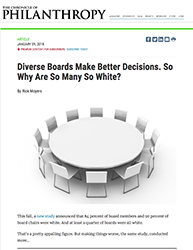 More than a quarter of boards are all-white. Exceptional nonprofit boards recognize that diversity is essential to an organization’s success. They see the correlation between mission, strategy, and board composition and understand that establishing an inclusive organization starts with establishing a diverse and inclusive board. The typical approach to the demographic shift is to count people — by race or ethnicity, gender, sexual orientation or gender identity, physical ability, or age. In 2001, the Council of Michigan Foundations started promoting a different approach. It encouraged its members — 350 grantmaking organizations working together to strengthen, promote, and increase philanthropy in Michigan — to move beyond counting people to people counting. Inclusivity, a critical component of board culture, often gets reduced to discussions of diversity which are important in terms of board composition, but do little to address the more important issue of valuing and appreciating how cultural difference enriches board work, strengthens governance, and underpins responsible community stewardship. We recognized that for organizations of color, women’s organizations, immigrant organizations, and others, demographic diversity may be inappropriate, or framed differently. In this article, we build from there for an organization that knows what board members need to do, and as a result, who they might need to be. 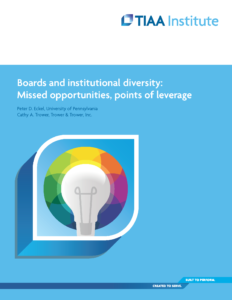 Within BoardSource’s 2015 governance index, “Leading with Intent,” there lies an interesting paradox when it comes to board diversity. Forty-five percent of the boards and 69 percent of the CEOs surveyed are dissatisfied with their board’s diversity. If boards are so dissatisfied with their racial makeup, why is so little being done to improve these numbers? These survey results leads one to think it must at least partially be connected to how board members are recruited. Organizations need to make recruitment a more holistic, intentional process, champions of diversity say. Too often, charities do casual searches that rely on scanning candidates’ credentials and tapping board members’ personal networks. Instead, they need to purposely seek individuals who might never hit the radar of a traditional search. I am a millennial. I am a black man. I am a fundraiser. I am a board member. These are some of the ways I describe myself. Yet, as my experience in the nonprofit sector has deepened, I have discovered that many board leaders describe me a different way: I am a unicorn. 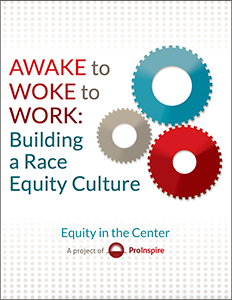 Building Movement Project’s just-released leadership report (June 2017), “Race to Lead: Confronting the Racial Leadership Gap,” highlights what many of us know: The nonprofit sector is experiencing a racial leadership gap.